“ABORIGINAL POINT OF VIEW” IN LONDON. at News Aboriginal Art Directory. View information about “ABORIGINAL POINT OF VIEW” IN LONDON. “ABORIGINAL POINT OF VIEW” IN LONDON. “It is a display that is objective and intelligent enough to recognise the gulfs in understanding between Europe and Australia, not as something to be vainly bridged by an apologist, or as sentimental history, but as an indelible and unmovable part of an indigenous narrative that began 50,000 years before Abel Tasman's 'discovery'. That is something not done through overly complex interpretations but a considered approach to a 'big country, big story' that lays out the indigenous heritage before showing the cultural blistering caused by Cook's claiming of the continent in 1770”. That is not only an analysis of the British Museum's 'Indigenous Australia : enduring civilisation' exhibition with which I agree, but it's also significant in appearing in Spear's magazine (in the words of writer Alex Matchett). Spear's is that 21st Century phenomenon – a publication entirely aimed at High Net Worth Individuals (bankers, lawyers, financiers, etc) rather than being a warmly sensitive cultural or lifestyle magazine. The British Museum's Indigenous curator, Gaye Sculthorpe was particularly pleased that her intimate show within the vastness of a museum that receives 7 million visitors a year had got the attention of such a readership. When the show opened in April, I reported on positive reports from The Guardian (“a fabulous beast”), The Daily Telegraph (“What begins to emerge is a complex, varied land with multiple trading connections – and a profound relationship with nature.”) and The Independent (“A very compelling story of 60 millennia of resistance”), as well as some idiocy from Zoe Pilger, who jumped up and down about several of Daddy John's bugbears. Having now seen the show in London myself and talked to Sculthorpe, I can hail the exhibition's achievements in using some of the 2000 artefacts and artworks that the BM holds but rarely shows very effectively to introduce an international audience to the reality and variety of Indigenous civilisations in Australia before moving on to the more contentious matter of how Anglo-Irish 'invaders' (a word much used in the catalogue texts by academics who've tended to shy away from it before) tried and failed to understand what they were encountering. Given that as acute an observer as The Australian's Rosemary Neill could write that “Dispossession is a key aspect of the British Museum's Indigenous Australia show”, I need to stress that this aspect only emerges in the second of two rooms after viewers have had ample opportunity to take on board such matters as the language/tribal map of Australia showing just how many different groups of people there were in 1788 - “that's been a revelation for so many of our visitors”, says Sculthorpe – and the significance of Country for Indigenous Aussies. It's explained in the words of the 2007 Young Australian of the Year, Tania Major, who simply puts the intimate relationship between Man and land down to asking viewers to imagine what having their family live in the same house for 40,000 years would be like. Incidentally, the word Country appears in every chapter heading in the exhibition's excellent catalogue – which really is a primer of Indigenous history that is worth having in your home or school quite separate from the London exhibition. Several reviewers assumed that all that was in the catalogue was in the show – but it's much more extensive. The National Museum in Canberra is selling it (as may be other sensible galleries and bookshops), for about 70% of the BM show is already being put into packing cases for shipment to Canberra and the related exhibition at the NMA in November. Obviously, it will not need the BM's international focus. 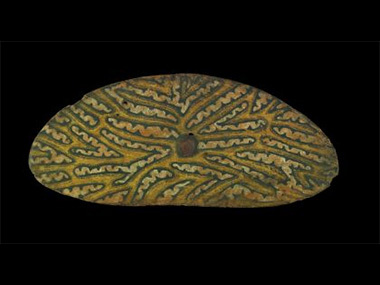 But the array of 19th Century artefacts should be an eye-opener to many locals – Indigenous or not – from the bloodied Davidson Shield of 1872, via Nigi's simply amazing crocodile mask from Mabuiag in the Torres Strait (1885) to the startlingly industrialised pituri bags that reveal not only how Aborigines got high but also how trade links across the country operated well before Western Capitalism reached the Great Southern Land! I wondered whether this emphasis on trade was made in order to suggest a “civilisation” comparable to Europe's. 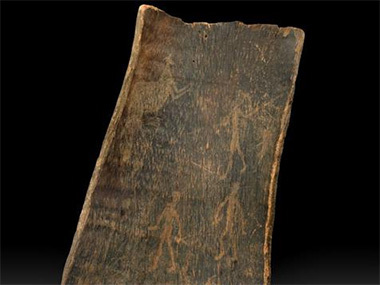 But Sculthorpe responded that it was, instead, to make clear that Aborigines were not isolated on this distant continent, having links with the peoples of the future PNG and Indonesia that lasted for generations, as well as communication across the continent. What a change from the last BM Aboriginal show! The largely forgotten 1973 event (certainly forgotten by the publicists who claimed a “first” for this year's effort) was a totally ethnographic picture of the “noble savage” Downunder, with just a hint of Daisy Bates's “Passing of the Aborigine” - it's all over now, ironically just as the emergence of art at Papunya was proving the precise opposite! Same objects, perhaps, but very different interpretations: 1973 could never have countenanced a dialectic didactic like “Australia is still seeking to reconcile conflicting world views into a more cohesive future”! Or to have reminded viewers that the Australian Constitution in 1901 determined that “Aboriginal natives should not be counted”. 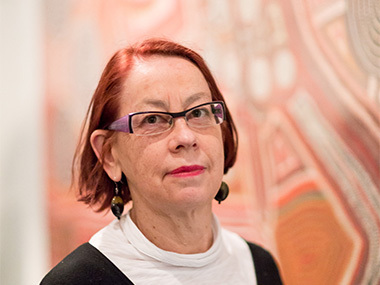 Gaye Sculthorpe – a Tasmanian Palawa woman - naively insisted that 2015's 'Aboriginal point of view' emerged solely from the artworks and texts on display. But of course, she'd chosen them all as full-time Curator of Oceania at the BM. And of course, there's not just one Indigenous point of view. The Dja Dja Warrung people of Western Victoria have already gone to court to try to seize back barks collected by one John Hunter Kerr in the 1850s and sent to the Exposition Universelle in Paris. From there they made it to Kew Gardens and thence the BM. The emu-shaped bark is exceptional. But would it have survived at Ferryhurst for 150 years? And don't forget that even if it had entered the Australian Museum collection, it would have been incinerated in Sydney's Garden Palace fire in the 1880s. But how does the Dja Dja Warrung attitude stack up with Kamilaroi artist and curator Jonathan Jones' contribution to the exhibition? “Objects (like this) in collections are gifts from our ancestors” - a statement which he backs up in the catalogue by quoting Moidaban elder, Sandy Atkinson: “These artefacts, that's what we've got to learn from, from the past where art was an important way of life, where art was a recording of history”. “Making these connections”, Jones concludes, “begins to undo the acts of colonialism”. It'll be interesting to see whether that's the attitude that prevails when the National Museum show opens. But there's no doubt that curators there and at the BM have done their utmost to link the objects they've chosen to show with descendants of the people who created them. So the catalogue image of Nigi's wonderful crocodile dance mask is pixellated in two places at the request of Mabuiag people who remain sensitive to its complete unmasking, even 130 years after its making. Apart from Nigi, heroes that emerged from the exhibition were the Tahitian man, Tupaia who joined Cook in Tahiti in 1770 and drew delicate pictures of Aborigines fishing in Botany Bay – some of the first images of Australia's indigenes to reach Europe; William Dawes, the love-lorn Lieutenant who recorded some of the Gadigal language in 1789 Sydney as he gently courted the lovely young Patyegarang (when will his notebooks be published??? ); and Major Thomas Mitchell, NSW Surveyor-General, one of the most sensitive and acute observers of the Indigenous scene as he made first contact from the Murray to Carnarvon Gorge in Queensland. Oddities included several references to “soul” - as in “the goose nest is the resting place for the soul” - a concept I've not encountered in Aboriginal culture before, and unexplained in the catalogue; and the dominance of Spinifex art – recent purchases, and perhaps relevant to an English audience who might feel just a modicum of guilt over the Spinifex peoples' displacement by the atomic testing at Maralinga! Uta Uta Tjangala's magisterial birth story, 'Yumari' is, by comparison, a much stronger and more cogently explained artwork to represent the art movement of the past 40 years. One might also argue that the two room show was less than such an “enduring civilisation” really deserved. “I had no frustration with that limit”, Gaye Sculthorpe assured me, “because the visitor's hour – the amount of time we expect them to dedicate to the show – was fully engaged reading our texts. It seemed like the right amount of space to tell the story. We weren't trying for the lot! And we backed up the exhibition with talks, films, dances and panels on collecting Indigenous art”. I note one lecture was on the Black War in Van Dieman's Land – a subject no doubt close to Sculthorpe's heart. And that passion, combined with her dispassionate capacity to “tell the story” may well lead to the BM's Australian material getting a permanent place in the museum – alongside such novelties as the Rosetta Stone and the Elgin Marbles. It's hard to resist leaving the last, colourful word to Spear's Alex Matchett - more a Ten Pound Pom (the cost of entrance), I suspect than a High Net Worth Individual: “Land lies at the heart of the matter for both sides. One can almost see the chasms of ignorance yawning from Cook's flagpole; he claimed an entire continent on his assumption of Terra Nullius, the concept of no one's land. It was the caveat that swallowed the future of the Aborigines. Perhaps if the British had had the mindfulness of place represented by the 'Dreamings', rather than a hole in their own map marked 'Nondum Cognita' (not yet known) and the misplaced prerogative of a painted cloth on a stick, they would have avoided their mistakes”.